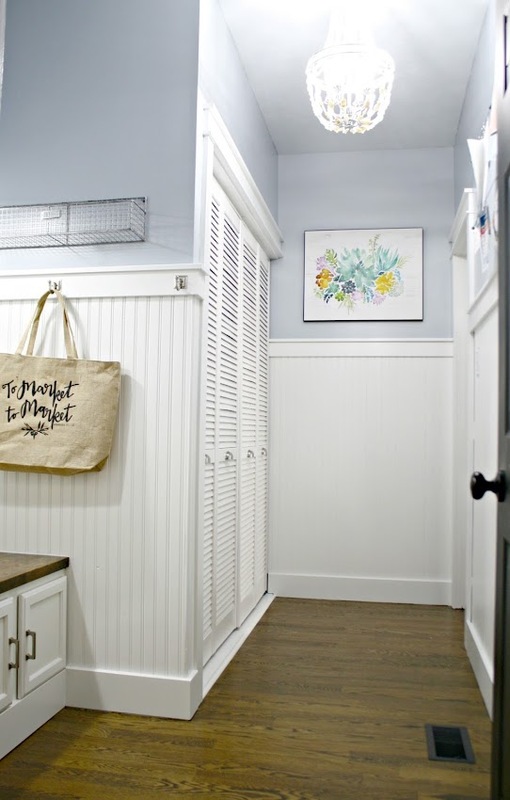 Our mudroom makeover -- from dark to bright and light! Hey there! 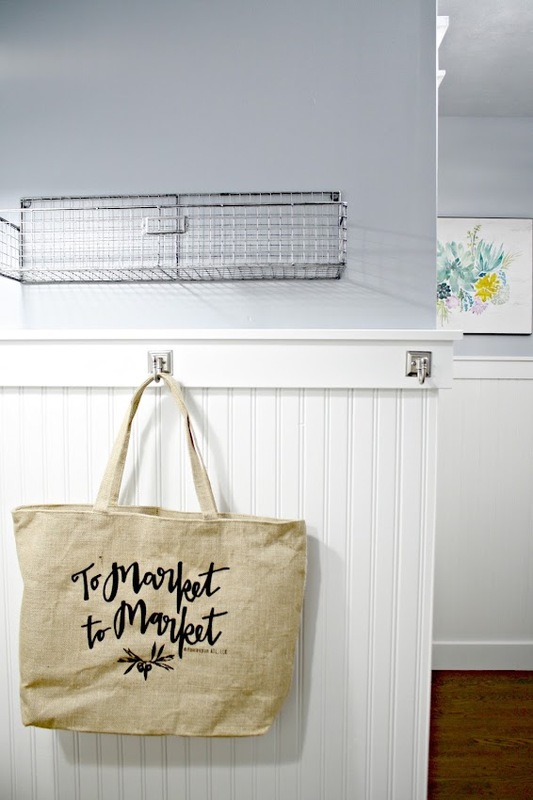 So you know how I recently finished up a huge renovation in the loft upstairs? Yeah, well I added another room redo in the midst of finishing that up. Let me back up and mention right here that I am a little crazy. 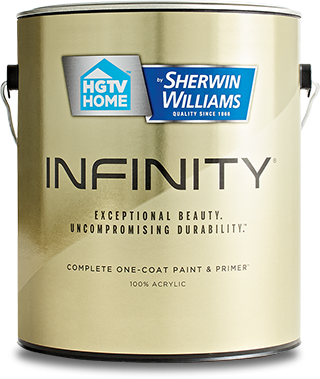 When the folks at HGTV HOME by Sherwin-Williams™ asked me if I'd like to paint a room and share their new INFINITY paint line (now available exclusively at Lowe's, yay! ), I was super excited to share it with you, so of course I said yes! It started out that I was just going to paint some walls, and then it snowballed from there. BIG time. 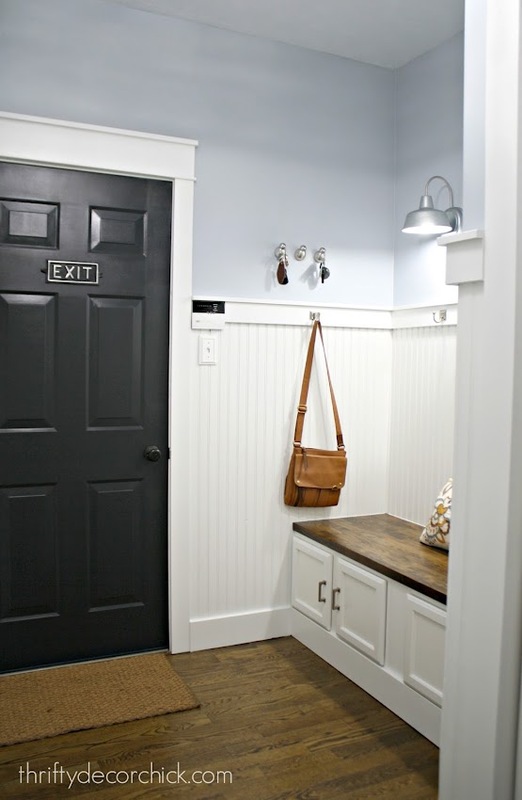 I ended up painting all of the trim and beadboard in our mud room and then the walls as well. 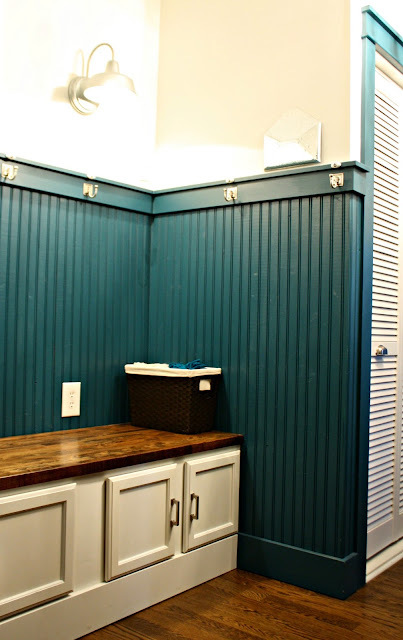 I am so excited to show you this transformation! The difference is SO big. I quite liked it for some time. It was different for me and I loved the peacock blue. (It's called Reflecting Pool.) It's a beautiful color! But I am a classic lover at heart and I was craving a more traditional look in here. Soooo. I decided to paint the entire room, nearly top to bottom. Good idea at the time! :) I'm so thrilled with the result that all the work was worth it. 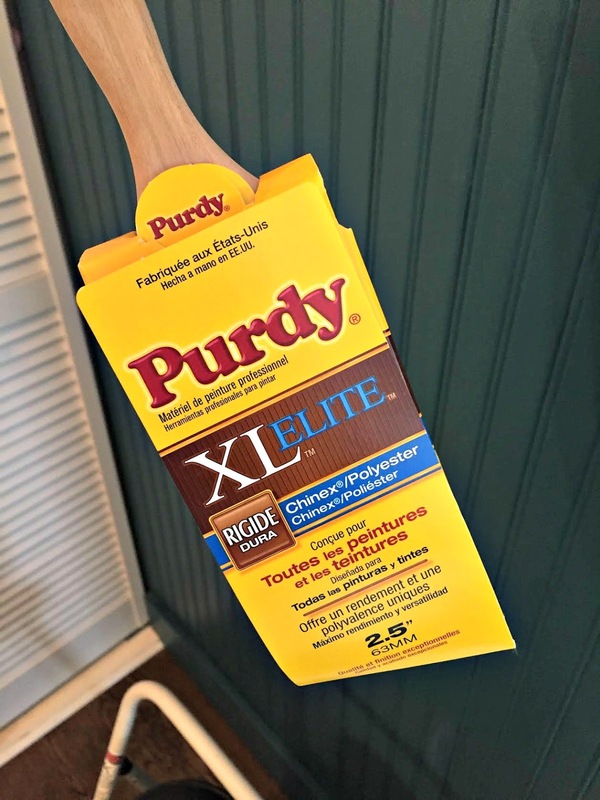 The Purdy XL Elite Glide was so helpful as I worked on the room. 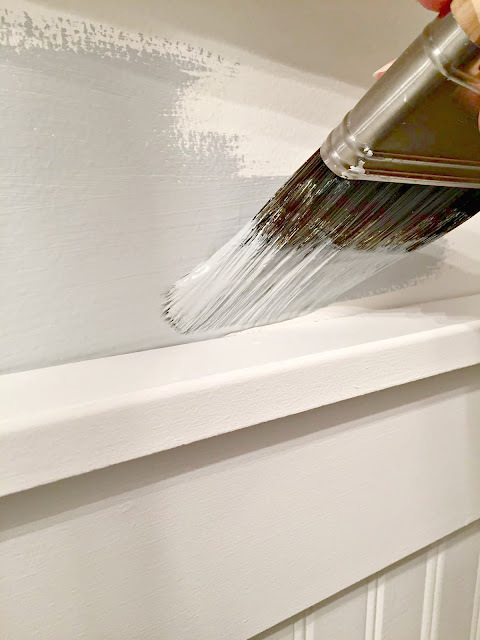 An angled brush is a must when painting trim and cutting in at ceilings. It makes the job so much easier! Then it was time to start the beadboard. I was dreading this part -- in the past I've used a roller and then had to use my brush to get in between the "beads" in the board. 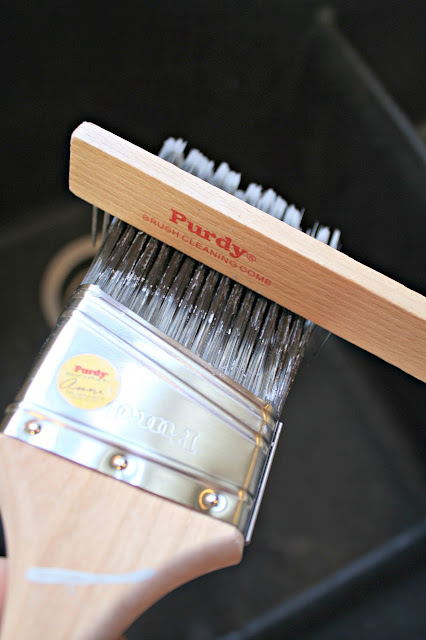 The Purdy Ultra Finish Roller I used was super thick and lush (it was a 3/8 inch nap) and I literally uttered a "hallelujah" out loud when I first rolled it on. It holds so much paint, I was able to fill in about 90 percent of the gaps with just the roller. This saved me SO much time -- I was thrilled. I only had to go back over a few spots with the brush to fill in spots that the roller didn't get. It takes some practice to get the hang of cutting in but it's worth learning! 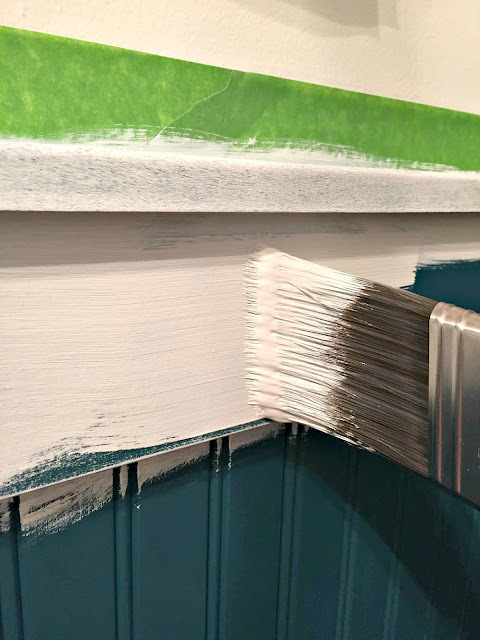 It will save you a ton of time taping off trim and ceilings. An angled brush like this one is the best for cutting in because it allows you to push the brush right up against the trim -- the angle gives you nice control. I've used one for years and it saves me hundreds of dollars in new brushes. You use it to clean out the brush and it really does a great job of getting the gunk out. They will stay nicer for much longer with this tool. I clean it with the comb, squeeze out the excess water and then comb through it a few more times. The shape stays looking like new when I take this extra step. Do you see the hint of fall on the wall? I shared Rachel's beautiful fall printable last year and thought it would look so lovely in here. :) When I finish the shelving above the bench I'll be adding more art in here as well. I'd never thought I'd say it but I kind of like them now. Who knew? I have a couple more updates to make to this room -- shelving above the bench will go up to the ceiling and then crown molding will go around the whole room. THEN this room will be done and I will be so very happy. Well, I'm already happy. But extra. I use it for stuff that needs to go out to the car (I emptied it out for pics). I found when I had baskets on the bench they just filled up with stuff and it annoyed me. 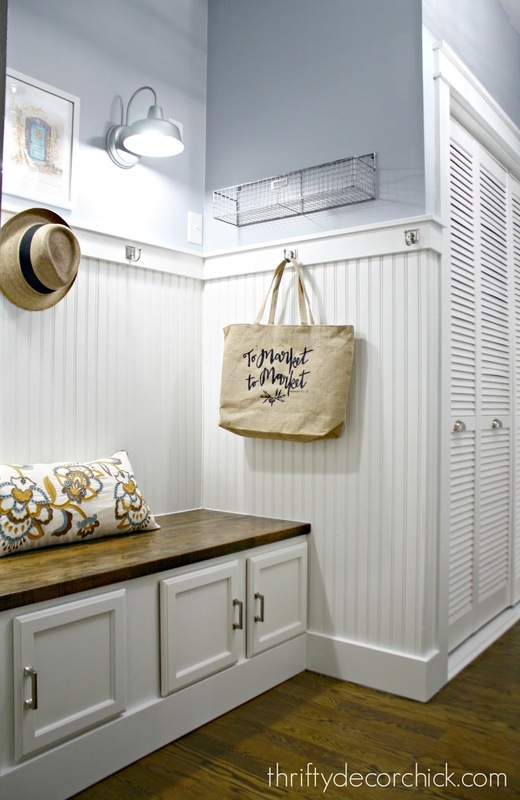 :) The shelving above will hold baskets and those will store random items that need a spot around the house. They will be higher and won't be something we'll access every day. 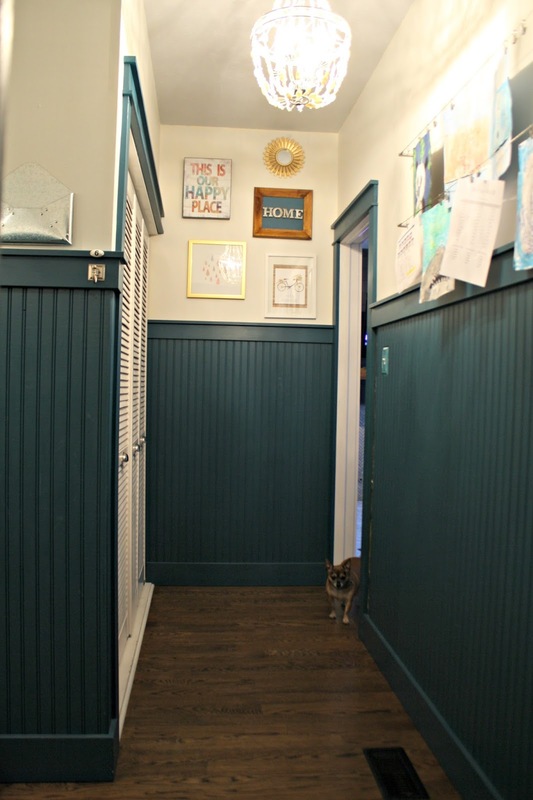 I have to mention that we were both shocked at how much brighter the room got when the beadboard went white. I know, it's not surprising that would happen, but the difference was so noticeable. I mean, the walls were white before -- it was that dark blue that was sucking all the light from the room. We love the change. 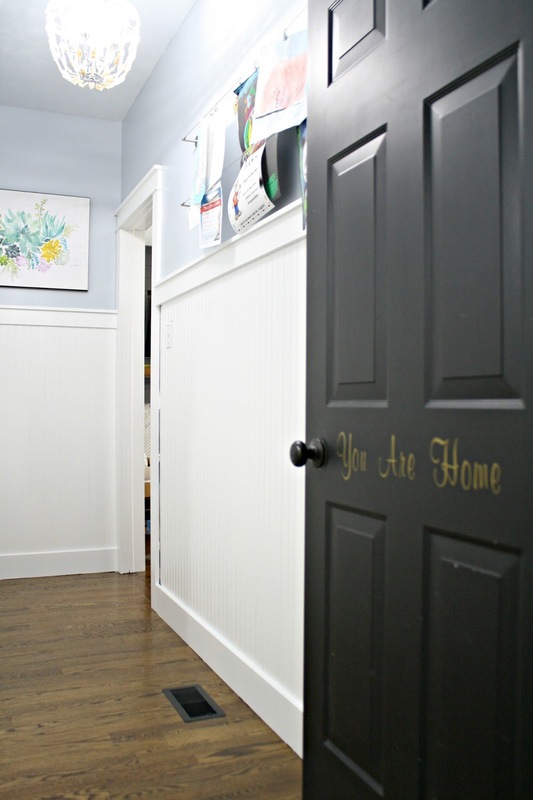 I still like a warmer tone for most rooms in our house, but darker rooms look like new spaces with just the bulbs. See how the old bulbs made the white walls look yellow? With no natural light that's what happens with incandescents. That blue really was lovely -- it's a beautiful color! 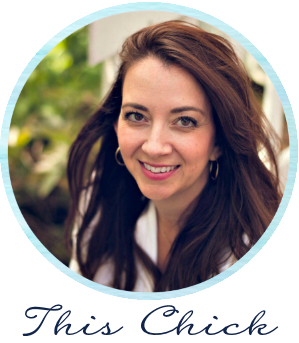 I just didn't mesh with the rest of our house and I was ready for a change. Full disclosure -- I opened the door to our garage and climbed on to the hood of my car to take this photo. Ha! This is how it looked most days. 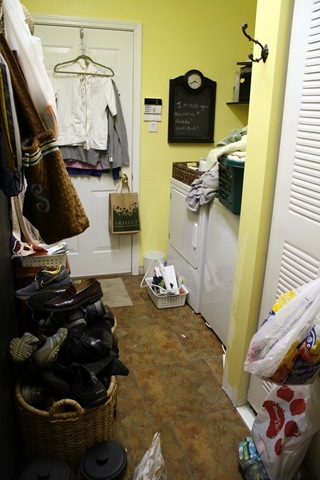 It drove crazy to have the laundry right by the door. Big change right? 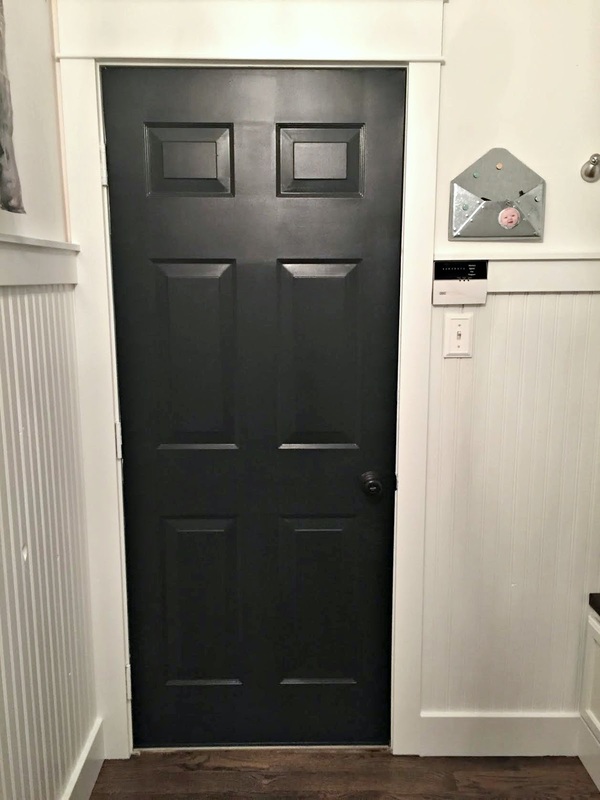 Have you tried dark trim in your home? I've seen it done beautifully but all one color was too much for me after time. This still gives me a bit of contrast but with lighter colors. Have you used the new HGTV HOME by Sherwin-Williams paint from Lowe's? I think it's awesome that Sherwin-Williams paints are available there. This is the first time in 40 years they've sold outside of their paint stores! If you've tried it out for yourself you can add your own review here. This post was sponsored by Purdy and HGTV HOME by Sherwin-Williams but all thoughts and experiences are my own. I only work with brands I use and love! Wow that looks really good! The white beadboard makes the room look soooo much bigger than the peacock!! Isn't it crazy how much bigger it feels? We noticed it immediately. It really does look better. I loved the dark before, but this is awesome. It looks SO beautiful! I love the bright white trim and the new blue color! I loved the peacock color, but I have to agree, the new colors make it so much brighter and bigger! I just got Sherwin Williams Whole wheat for my front and back entry ways. did you use 2 colors for yours? thanks.. 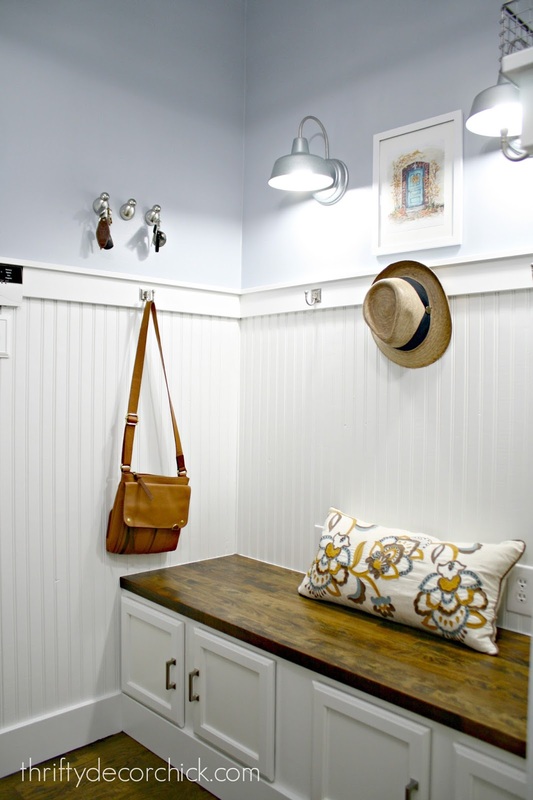 Your mud room looks great! It's a lot brighter now. 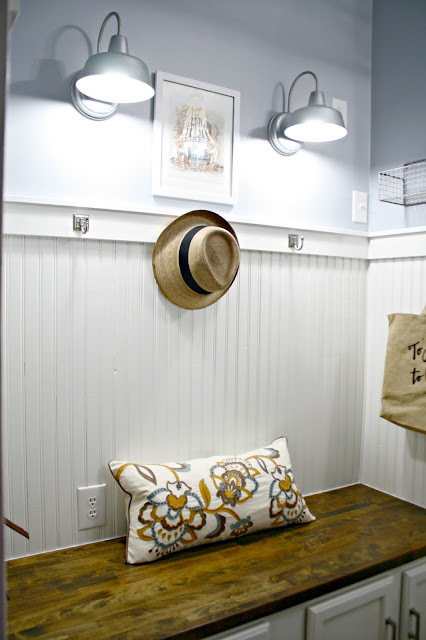 Love the bench and glad you left the top stained so you can see the wood grain. Nice job! I'm using the HGTV Showcase paint (color Red Tanager) for the interior doors in our cabin. I really like how the semi-gloss feels when it's dry- and it dries fast! I've been thinking of using those same barn lights next to our front door. Can you tell me how high you hung them? I was concerned the light would be glaringly bright if I hung them too high. Girl, you've been BUSY!! I'm starting to feel like a slacker over here, seeing all of your projects. Love the classics - so fresh and pretty! love it! it's really so bright now! Beautiful transformation! I let out a little squeal when I saw you used Krypton! Love that color! Wow! Such a huge transformation! I love how the wood floor/bench really stands out now. 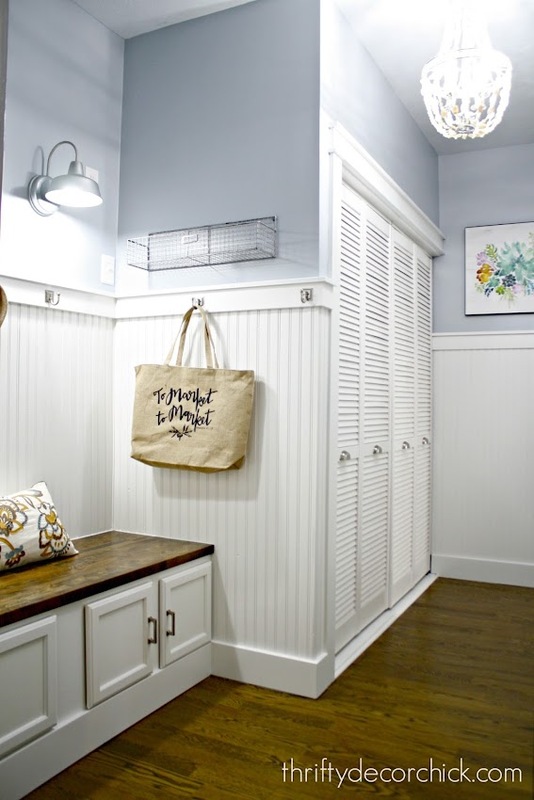 What a beautiful transformation... just love the blue and white....Will have to check out the Krypton as it reminds me of the SW Silvermist I use in my home..such a bright and cheerful mudroom! Love it! 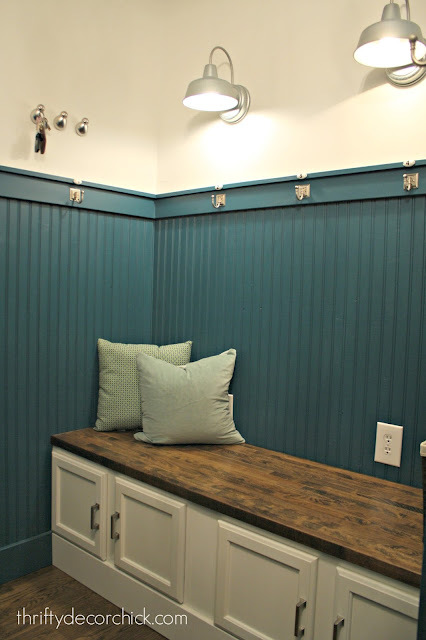 We painted our kitchen Krypton this summer and I love the color! It looks great with our white cabinets and trim! Looks fantastic, I love that Lowes now carries HGTV paints.. Have been painting all year with it.. It is fantastic. It looks very nice! I wonder what it would have looked like whitewashed so a shadow of the blue showed through. This was such a great update! 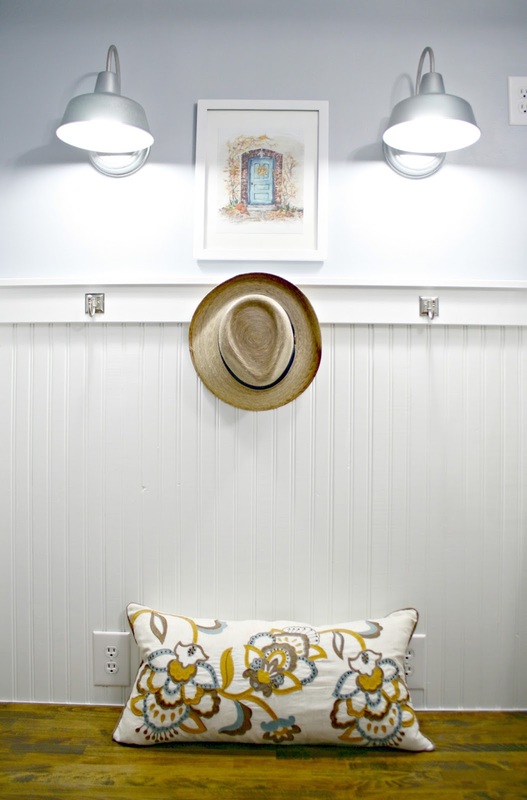 I totally get wanting to try something outside the norm, but this white beadboard and trim seems like a better match for the rest of your home and it seems so much more spacious! I love the new colors! So fresh and clean. I love that floral art on the back wall, do you mind sharing where its from?